When the head of the world’s richest corporation suspends one of it’s executives for extravagance and an overly lavish lifestyle – I stand up and take notice. 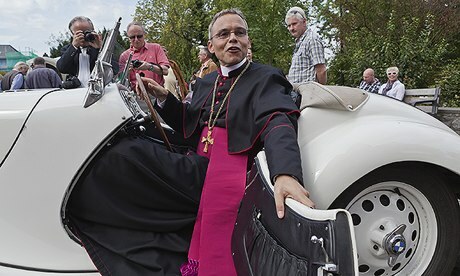 When that CEO is the pope, executive the Bishop of Limburg – you have my full attention. This is worth pondering; the Catholic church isn’t an institution known for airing their dirty laundry. So what does it take for the Vatican to draw the line? At what point does the pope stand at attention and declare – “oh hell no”? It appears the Bishop of Limburg knows the answer to those questions – Bishop Tebartz-van Elst probably shouldn’t have spent $42 million renovating his official residence. Even if he bathed in holy water, a bath costing $20,000 is hard to explain. Travelling on a first class ticket to visit the poor in India is a no brainer. Perhaps his nickname – the “Bishop of bling” sealed the deal. Lies to the court under oath about spending, certainly didn’t further his cause. What does the church do with a suspended Bishop? If this were a sexual abuse scandal, he might be hustled off to another diocese or “retired” to a sleepy little corner of the world. The Bishop of Bling is only 53 years old – retirement not much of an option. Pope Francis has a true papal quandary to resolve; abusive priests are old news – public admission of flagrant, self serving excess, poses an entirely new set of considerations. The outcome should prove interesting.